When I first owned a copy of The Story of My Life (Orleans Records) by Guitar Slim Jr. in 1988, I was in my early years as a blues fan. I had only recently found out about his father, Guitar Slim, via a few songs collected on the Guitar volume of Atlantic Records 4-Volume Blues series released a few years before. I found out that the elder Slim (born Eddie Jones on December 10, 1926, died in February 7, 1959 at age 32) inspired a whole bunch of later guitarists, notably.Buddy Guy, Albert Collins, Chuck Berry, Guitar Shorty, Billy Gibbons, Jimi Hendrix, Stevie Ray Vaughan among others. Despite his intentions, The Story of My Life includes seven Guitar Slim Sr. songs (“Trouble Don’t Last,” “Letter To My Girlfriend,” the title track, “Bad Luck Blues,” “Reap What You Sow,” “Well, I Done Got Over It,” and “Sufferin’ Mind”), and listeners can hear some of the same vocal qualities shared between father and son, as well as on guitar, which is not surprising because Slim Sr. influenced so many other artists. However, Slim Jr. doesn’t resort to slavish imitation. He puts his own spin on his father’s songs and shows himself to be a very creative musician in his own right. The Story of My Life also includes a few covers of soul tunes, including a pair from Tyrone Davis (“Can I Change My Mind” and “Turn Back The Hands Of Time”) and Clarence Carter (“Too Weak To Fight”). Slim Jr. proves to be a very talented vocalist in the soul/blues vein, too. Produced by Orleans Records chief Carlos Ditta, The Story of My Life features a team of New Orleans’ finest musicians at the time, including Preservation Hall drummers Shannon Powell and Kerry Brown (of Slim Jr.’s band), Iguanas bassist Rene Coman and Deacon John bassist Charles Moore, pianist (and future Grammy winner) Jon Cleary, and the legendary Milton Batiste blowing trumpet and arranging horn charts. 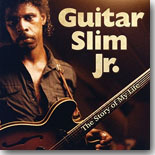 The Story of My Life was nominated for a Grammy in 1988 for Best Traditional Blues Album and Guitar Slim Jr. enjoyed a bit of fame, opening for (and becoming friends with) Stevie Ray Vaughan and meeting other artists like Gatemouth Brown, Johnny Winter, and Prince (who actually recorded a never-issued album with Slim Jr. at his Paisley Park studio). However, hard living and partying and waning enthusiasm for the music business slowed Slim Jr.’s career momentum. He has recorded a couple of other studio releases (1996’s Nothing Nice and 2010’s Brought Up The Hard Way), plus several discs capturing his live appearances at recent New Orleans Jazz and Heritage Festivals. He’s still a great performance, but probably his own worst critic. Guitar Slim Jr. should stop being so hard on himself, because The Story of My Life is one of the finest blues releases of the late '80s and is deservedly being reissued on CD and, for the first time, on vinyl.